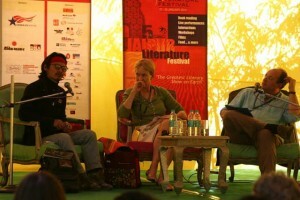 Dharamshala [Tibet.net]: The issue of Tibet was featured as one of the theme at Asia’s biggest literary festival being held at Jaipur in western India from 21 -25 January. Over 200 writers from 30 countries have gathered for the five-day literary extravaganza at Diggi Palace, a sprawling 19th century mansion. A group of aspirant poets and writers, including Tenzin Tsundue and Bhuchung D Sonam, attended the festival. Bhuchung D Sonam’s latest book of poetry Songs from a Distance was made available for purchase at the festival. Tsundue hopes more Tibetans can participate in the festival in the future, Phayul.com reported. The Tibetan writers join William Dalrymple and Isabel Hilton, renowned writers, to deliberate at a session on “Tibet”. The discussion covered a huge range of issues like human rights in Tibet, Panchen Lama, Tibetan democracy and future Tibetan leadership. The festival hosted several noted luminaries including Nobel Laureate Wole Soyinka, Vikram Chandra, Roddy Doyle, Louis De Bernieres, Esther Freud, Girish Karnad, Chetan Bhagat, Nayantara Sahgal, Roberto Calasso, Devdutt Patnaik, Claire Tomlin, Michael Frayn, Gulzar, Shabani Azmi, Javed Akhtar, Meghnad Desai, Pavan Varma, Mark Tully, Her Majesty Ashi Dorjo Wangmo Wangchuk of Bhutan, The Hindu reported. Last year, the festival played host to more than 100 writers and attracted 20,000 visitors. The festival has become the official annual celebration of a vibrant and resurgent Indian and South Asian literary scene. By the time the festival ends on Monday, organizers estimate that some 30,000 people will have seen more than 200 authors and other speakers, according to The New York Times.